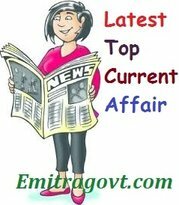 Current Affairs Question 2017: Looking for 26 August Current Affairs? Then start your Quiz right now by answering them. Here in this article, we are giving the Current Affairs Quiz with Questions and Answers. As many people are preparing for various government exams it became mandatory for them to get a grip over the current affairs as in most of the tests are based on Daily Current Affairs. By taking this kind of Current Affairs Quiz candidates can eventually get hold of what they have been working on. Contenders can trust us as we will update all the latest Current Affairs in this quiz. For more such quizzes check our site Emitragovt.com regularly as we will update the Daily Quiz for current affairs. 1. General Electric (GE) announced the appointment of Vishal Wanchoo as President & Chief Executive Officer of GE South Asia. 2. Sanjivani Jadhav, one of the rising stars of Indian athletics, clinched the silver medal in the women’s 10,000 metres at the 29th World University Games. 3. Prime Minister Narendra Modi and actress Priyanka Chopra have found a spot in the Social networking site LinkedIn Power Profiles List of 2017. Professional networking giant LinkedIn on Wednesday announced its fourth edition of Power Profiles, a list of the most viewed LinkedIn profiles of professionals in India. 4. Ashwani Lohani, CMD of Air India, has been named the Chairman of the Railway Board following the resignation of A.K. Mittal. While, Rajiv Bansal has been made Chairman and Managing Director (CMD) of Air India for three months. 5. The Airports Authority of India (AAI) has entered into strategic alliances with Ola and Uber that will provide passengers the option to hire these cabs at select aerodromes. 6. The nine-judge Constitution Bench of the Supreme Court headed by Chief Justice of India JS Khehar in a landmark unanimous decision has declared right to privacy a fundamental right under the constitution. 7. The Cabinet Committee on Economic Affairs (CCEA) approved the name of the new central food processing scheme as Pradhan Mantri Kisan Sampada Yojana (PMKSY). It aims to benefit 20 lakh farmers by 2020 and create 5.30 lakh jobs. 8. The Union Cabinet has given its approval for signing of a Memorandum of Understanding (MoU) between India and Nepal on Drug Demand Reduction and Prevention of Illicit Trafficking in Narcotic Drugs and Psychotropic Substances and precursor chemicals and related matters. 9. Tata Sons appointed Roopa Purushothaman as Chief Economist and head of Policy Advocacy to drive research. 10. India’s oldest cinematographer Ramananda Sengupta died. He was 101.